Prime Minister Binyamin Netanyahu on Saturday night responded on Twitter to the leftist demonstration against the Nationality Law in Tel Aviv, in which participants waved Palestine Liberation Organization (PLO) flags. "There is no better evidence of the necessity of the Nationality Law. We will continue to raise the flag of Israel with pride and to sing ‘Hatkiva’ with great pride," Netanyahu wrote. Transportation and Intelligence Minister Yisrael Katz (Likud) said that "Palestinian flags are being hoisted tonight at Rabin Square in Tel Aviv, in protest against the Nationality Law. 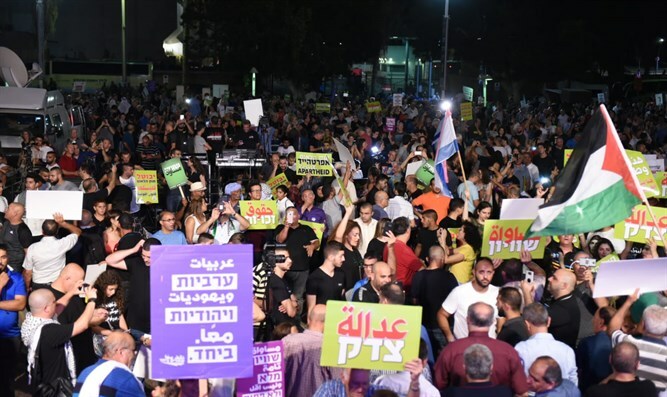 [Joint List MKs] Ahmed Tibi and Ayman Odeh and their friends are protesting against the Jewish nation and in favor of the Arab-Palestinian nation. It is not the words in the law that bother them, but rather the existence of Israel as a Jewish and democratic state. They will continue to demonstrate and we will continue to build and strengthen the State of Israel." Minister Ze’ev Elkin (Likud), one of the initiators of the Nationality Law, said, "As I said this week in the Knesset: When Ahmed Tibi and Hanin Zoabi object to the Nationality Law, together with these demonstrators with Palestinian flags, I understand why they are doing it. They truly are opposed to Zionism and to the fact that Israel is the state of the Jewish people and was established as such by the United Nations. But Yair Lapid and Tzipi Livni? Why are they opposed?" Deputy Defense Minister Eli Ben-Dahan (Jewish Home) tweeted, "The Israeli left at the demonstration in Rabin Square tonight proves only one thing - everything is proper in their eyes in an attempt to topple the government – even to join hands with radical Arab nationalism that waves Palestinian flags, refers to IDF soldiers as murderers and describes the State of Israel as an apartheid state." MK Oded Forer (Yisrael Beytenu) said, "Ahmed Tibi is receiving a tailwind from the left and while the State of Israel is paying him wages, he is working to negate its existence, with a PLO flag flying behind him. Whoever raises this flag supports the struggle against Israel and whoever supports the struggle against Israel cannot be an MK. So, Ahmed, go fly the flag in Gaza and renounce your citizenship here. I'm sure you'll enjoy it there." MK Oren Hazan, a member of the Knesset’s Foreign Affairs and Defense Committee, said, "For those who are looking for an answer to why the Nationality Law is more important than ever, it is enough to take a quick look at the square that is full of hatred to get the answer. They over there in the square are not one of us and want to take away what belongs to us. Raising the PLO flags in the square is no less than a violation of sovereignty and strong incitement against the state. I call on the Prime Minister and the Minister of Public Security to order the police to take down the flags and stop the disgrace."